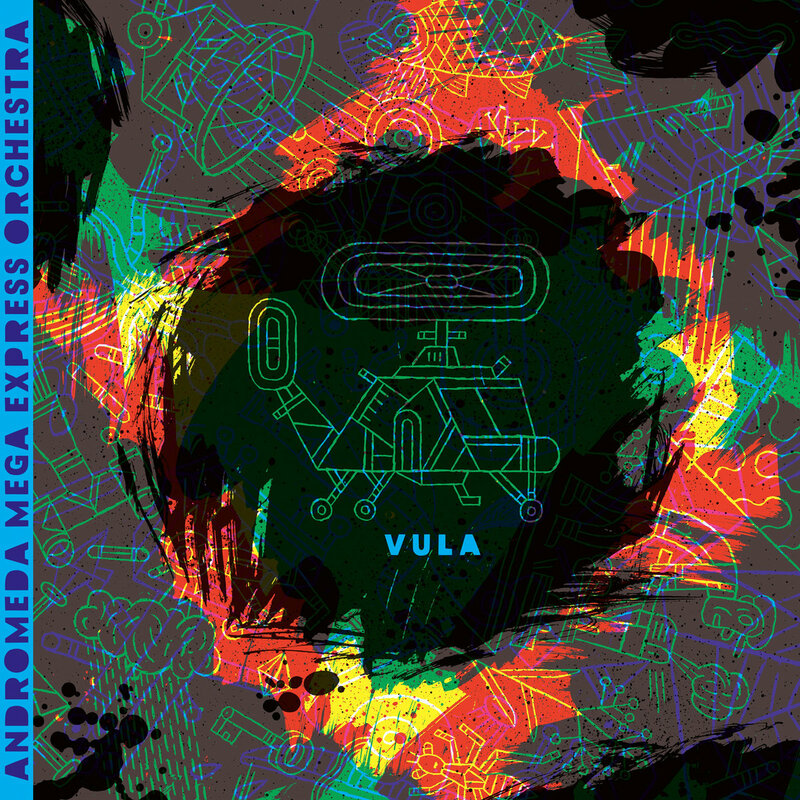 Berlin’s Andromeda Mega Express Orchestra returns with its fourth album “Vula”. Having celebrated their 10-year anniversary with a stunning series of concerts last year, the 18-piece’s new full-length showcases a stronger focus on harmony and melody – and yet AMEO sound no less explosive or unpredictable than before. It arrives gently, with shimmering lights, soft winds, sashaying melodies, and of course, the isotherms and isotheres function just as they should: All of a sudden, lighting strikes amid the concord of instruments, unforeseen energies erupt and upset the rhythmic scenery with elemental force. Making a combined effort to create sheltering patches of harmony within the unfolding drama, leader Daniel Glatzel and his 18-piece “working band” set out to harness album #4: “Vula” is out 09/07/ 2017 via Alien Transistor/Morr Music. Ranging from softly trickling melodies (“Lakta Makta Ha”) and hazy interludes, the mood, vibe, and pace change faster than cloud formations come flying across the screens nowadays (e.g. “qwetoipntv vjadfklvjieop” with its arrangement à la Helmut Lachenmann). In fact, even the flight of swallows is often misleading: head-nod bliss, motion picture soundtrack vibes, and even J.B. licks aren’t mutually exclusive in these compositions, as AMEO showcase with “J Schleia,” a track that nods both to Dilla/Grandmaster Flash and to Bach-era counterpoint techniques. Elsewhere, a pounding surf-rock beat metamorphoses over the course of 14 minutes (“In Light Of Turmoil”), only to see them return to patches that are surprisingly catchy and calm. The final applause turns out just as thunderous though, after the album ends with the vibrant and colorfully orchestrated “Papaya Flyers IX Epsylon,” a live recording that already foreshadows the group’s later collaboration with Hermeto Pascoal. A work that’s “born out of turbulent times – both internally and externally,” Glatzel says that AMEO’s fourth album is “generally driven by an urgent search for some kind of truth, a feeling that pushes its way through countless layers.” In fact, one can actually hear that the entire process, from writing to intricate post-production, took almost five years: “The album’s somewhat vintage, almost dreamlike and unrealistic sound is due to the fact that a full year lies between recording and mixing”, Glatzel explains. “It resembles the feeling of looking back and experiencing the past all over again. There was an element of detachment, but at the same time I was able to see things in a clearer light.” And it’s true: These puddles, rippled and ripped open by an onslaught of raindrops, do look even more magical in that sepia-hued light. A self-organized, independent group of likeminded individuals, AMEO is unlike any other orchestra: It’s a steadily working ensemble with a steady focus on experimentation. Comprised of 18 young, in-demand musicians hailing from various countries and musical backgrounds, its members have previously worked in constellations that couldn’t be more diverse – including Ensemble Intercontemporain, Tony Allen’s Afrobeat, Jazz-Legend Kenny Wheeler, Camerata Bern, The Notwist and post-conceptual artist Cory Arcangel. Daniel Glatzel, the orchestra’s leader and saxophonist, has been the main composer over the last decade since it’s inception in 2006, overseeing the groups three previous releases “Live on Planet Earth” (2014), “Bum Bum” (2012) and “Take Off” (2009). Besides playing concerts in internationally renown venues around the world, AMEO also hosts and curates its own genre-defying events such as their music festival “Kosmostage”, concert series and special projects with artists like Hermeto Pascoal from Brazil, tribal musicians from Malawi or the Latvian chamber orchestra “Sinfonietta Riga”.